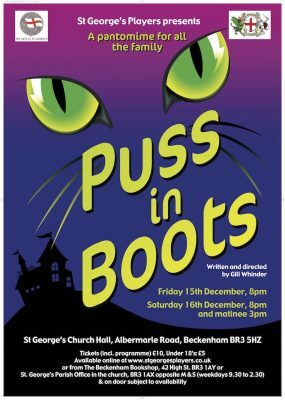 St George’s Players would like to invite you to their 2017 Pantomime, ‘Puss in Boots’, written and directed by Gill Whinder. Available soon online at via this link, from the Beckenham Bookshop 42 High Street, BR3 1AY and St George’s Parish Office in the church (BR3 1AX opposite M & S) (weekdays 9.30 – 2.30) & on door subject to availability. There will be a licensed bar or bars for this event under the auspices of a TEN licence from Bromley Council. Refreshments may be purchased during the interval only. St George’s Players are an amateur theatrical group re-formed in the early 1990s – although there had been similar groups before that. The majority of our members have church connections, and we maintain our strong links with the rest of the St George’s community. The annual pantomime – usually in December – is a regular feature, as is a shorter drama of a more spiritual nature performed during Holy Week. A wide variety of material has been presented over the last twenty years, and for the pantomimes the skills of writers and directors from amongst the Players have been used to good advantage. Other types of production have included one-act and three-act plays, music halls, revues and staged readings, with some items showing the considerable talents of younger members of the group. In the last few years, time pressures and the availability of the church hall have curtailed some of the variety – with the majority of effort going into the pantomimes and Holy Week plays. Whilst we have an active and enthusiastic team, we welcome anyone who would like to take part, either in an acting role or doing one of the many other jobs necessary to stage a production, such as front of house, backstage, make-up, lighting and sound, publicity, or serving refreshments. The Players have their own website which can be reached via this link. There you can find out about future and past productions, buy tickets and obtain contact details.